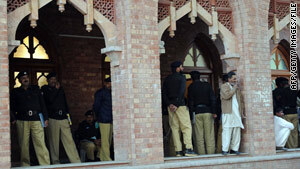 Pakistani police stand guard last week outside a Lahore court handling the case of five detained Americans. (CNN) -- One of five Americans arrested in Pakistan amid suspicions that they were plotting terror attacks has asked for a charge that would lead to a death sentence, a police chief said Tuesday. The men were taken into custody December 9 in the small Pakistani city of Sargodha but transferred later to a more secure location in Lahore, police said. The five are identified as Ahmed Abdullah Minni, Umar Farooq, Aman Hassan Yemer, Waqar Hussain Khan and Ramy Zamzam. A sixth man -- the father of one of the five -- also was arrested, police said. Sargodha Police Chief Usman Anwar said Zamzam asked authorities to "charge us with something that would lead to the death sentence." However, at the same time, he requested to be given asylum in Pakistan, Anwar said.
" 'You can put us behind bars for as long as you want, as long as you keep all of us together,' " Anwar quoted Farooq as saying. The five were taken into custody at a home belonging to Farooq's relative, where they were staying. "[The five] are quite composed and don't appear to have any regrets whatsoever," Anwar said. The order keeping the five in custody will expire by Friday. To keep them in jail, police must get permission from a judge. The court will want a report from police before reaching a decision, Anwar said. Anwar, who heads the Joint Investigation Team, said the group plans to recommend that the five be charged under Pakistan's anti-terrorism act. Conviction under that law can result in up to a life sentence. Pakistani authorities have described the men in a report as college students who "were of the opinion that a jihad must be waged against the infidels for the atrocities committed by them against Muslims around the world." CNN's Arwa Damon and journalist Umar Aziz Khan contributed to this report.